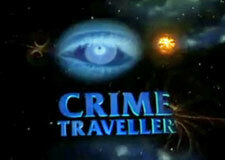 Crime Traveller: Mystery and Suspense on Television. Crime Traveller featured Michael French as Detective Jeff Slade who partners with Holly Turner (played by Chloe Annett), the inventor of a time machine that allows one to travel back in time, anywhere from several minutes to several days. Together, they use the machine to solve crimes. The series consisted of 8 episodes that originally aired on BBC-1 from March 1997 through April 1997. The series was created by, and every episode written by, Anthony Horowitz who was also developed and wrote the excellent Foyle's War series.